for Allegheny County Health Department (ACHD). It is one of the final projects of the MA program in Carnegie Mellon University School of Design. After the ACHD briefed us on the design problem, we began our desk research. First, we focused on demographic data, both at a national and local level. We explored the ecosystem of solutions that exist, from apps to books to websites to forums; looked into regulation and public policy around tobacco and tobacco use; researched various behavior change theories, and reviewed the health impacts of smoking. We visited stores where cigarettes are sold in the area, observed smokers on the street, and began looking for patterns and insights to direct us to questions for further exploration. Eager to get first hand insight from smokers and former smokers, we conducted several interviews to understand the key motivators for quitting, the most effective tools, and identify unmet needs. From our interviews, and further discussions of desk research, a few key interesting insights emerged that we decided to explore further. The key gaps we identified were, 1) challenges of identifying as a smoker, 2) need to address the ritual component of a regular smoking practice, 3) the ergonomics of smoking, and the need for a tool to allow users to ease into the process rather than require a commitment to quitting. After thinking on our learning from desk and interview research, we were both drawn to the idea of a game, something smokers could do to engage their network of support and distract themselves from the urge to smoke. We researched card and board games as well as other multi-player games and decided that a card game would be most feasible, considering the size and comfort of fitting it into a pocket or purse. And, since a deck of cards is about the size of a standard cigarette pack, a physical tool like this could serve an ergonomic function as well. Smokers could carry it around, feeling safe in the familiar weight of a pack of cigarettes. Because routine was also a key area of interest for us, we worked to dissect a smoker’s daily routine, looking for the key moments and motivators to smoke. From desk research and learning from interviews, we identified five critical moments in the day: the morning, when out with friends (especially while drinking alcohol), after meals, while waiting, and on work breaks. If these were the key moments prospective quitters were most tempted, we had to design a tool that could serve them in these key moments. It was after this interview that we decided we wanted to focus our cards on actionable activities rather than games, providing smokers with short, enjoyable distractions to fill the critical moments when temptation is high. We also decided to include a bonus category with fun challenging activities for competitive smokers looking for a playful push. We iterated quite a bit on category names as well as the name of the tool before settling on final titles. The ultimate decision to go with the names we did had a lot to do space constraints on the cards. The final selected titles were, Opt Out: A Deck of Cards to Help you Quit; Rise and Shine for morning cravings; Let’s Hang Out for a night out with friends; While you Wait for idle moments; Push Yourself for a fun challenge; On a Full Belly for after meals; and Take a Break for some much needed time off. The card design also went through several iterations. We worked with colors and shapes, starting from a tile-shaped geometric design to the more dynamic, diagonal design. We then worked to source and build activities for each of the six categories. Language was kept light and informal, and we even avoided referencing smoking and quitting to make sure our tool was approachable and universally acceptable by a range of smokers. The choice of casual language, and a fun, playful tone, also contrasted the harsh, scientific language of many smoking cessation tools that promote an all or nothing, committed approach to quitting. The low cost nature of our solution, lended itself well to the financial constraints of the Health Department, and to further make it easy to use and deliver, we designed it as a digital file to be hosted on the ACHD website and downloaded by users on an as-needed basis. To facilitate this, we produced a digital file of the cards, along with a fillable pdf, box templates, and instructions to be easily uploaded. We tested several box designs before settling on the most intuitive and easy to assemble. The pack we designed for keeping card is the shape and size of a cigarette pack, addressing the ergonomic and psychological comfort associated with carrying around a full pack of cigarettes. During the interview we found that many smokers have a strong need of carrying a replacement of cigarette packs because they habitually grab a box when they want to smoke. To prevent smokers to subconsciously find cigarettes, we designed a foldable box for keeping Opt Out cards so that smokers put them into their pocket. We also designed a different version of box for keeping cigarettes that smokers saved. So many researches and statistics indicate that smokers are highly sensitive on costs of cigarettes. These result was not different from what we found during the interviews - One of the main reasons of quitting was rising cost of cigarettes. Also, lots of our interviewees had a strong needs of visible achievement progress that encouraging their quitting. Our dark blue box shows smokers' quitting progress physically and instantly. The idea is simple; every time smokers complete activity instead of smoking, they put an unsmoked cigarette into the blue box. By keeping the physical cigarettes and counting the number of cigarettes they saved, smokers can check their quitting progress in short term and get a motivation to keep it on track. Because we envisioned a tool targeting smokers who don’t necessarily identify as smokers and/or smokers at a range of states of quitting, we knew we needed some sort of forward facing element to push smokers to download the tool. To meet this need, we designed a series of posters, mapping to the six activity categories, to be placed at strategic locations across the city. These posters will interact smokers in preferred smoking areas and suggest them to do alternative activities instead of smoking. In addition to prompting positive behavior, the posters were designed to nudge smokers to the ACHD website where they can download the complete deck. Below are the examples of visual communication of Opt Out. Though the ergonomics of the physical Opt Out cards are one of its strongest features, an app may exponentially extend the reach of the Opt Out program. The app would provide the activity cards in digital form, taking advantage of the technology to crowd-source new content, incorporate an interactive map, build a virtual community, and collect data to track progress and show aggregated impact. Through the app, crowdsourcing would extend Opt Out’s activity database and ensure something for every type of person. Additionally, a constant influx of new material means regular smokers would have continuous access to fresh content. Also, an interactive map is provided so that users can see all smokers within a certain radius opting out at any given moment. Users would be able to send each other encouraging messages, and if both parties agree, the app would facilitate real-world meetings. 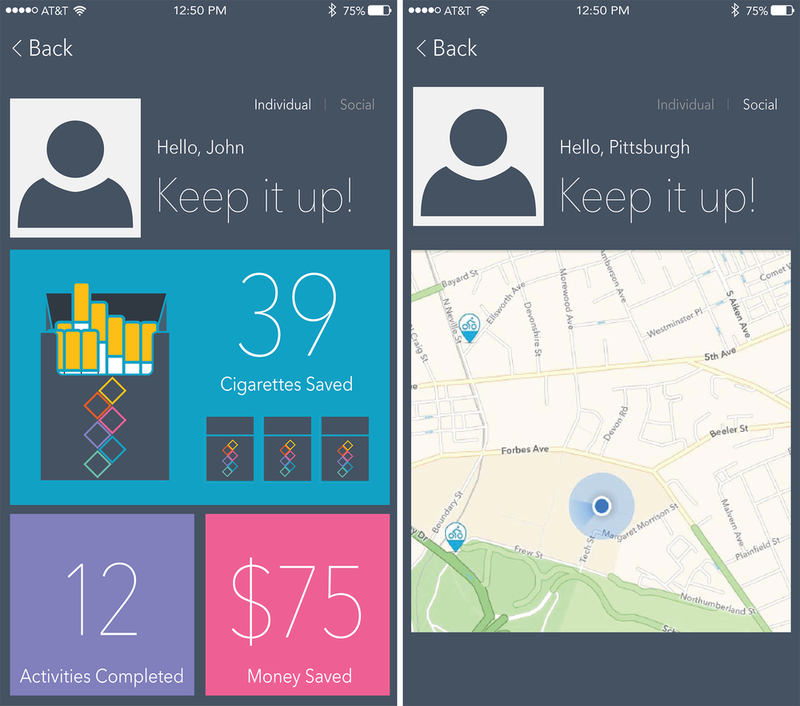 And finally, Opt Out the app would allow users to track progress and display aggregated data from all users opting out – total cigarettes not smoked, dollars saved, air pollution not produced, etc. By quantifying both individual progress as well as aggregating data at the community level, Opt Out helps smokers track the impact of their opting out, as well as position each individual’s behavior within the context of something bigger.